What Are The Characteristics and Structure of Enzymes? What are enzymes? They are highly specific, energized protein molecules made up of amino acids. The function of enzymes: They are organic, biological catalysts that start, promote and speed up biochemical reactions. The specialized molecules have active sites that are receptors for specific substrates. They are generally named for the substrate they act upon and end in the suffix -ase. For example, lactase works on the substrate lactose - a milk sugar, and lipase breaks the molecular bonds of lipid (fat) substrates. When a substrate makes contact with the active site of an enzyme, it is transformed into an end product. Once the process is complete, it releases the product and is again available to interact with new substrates. 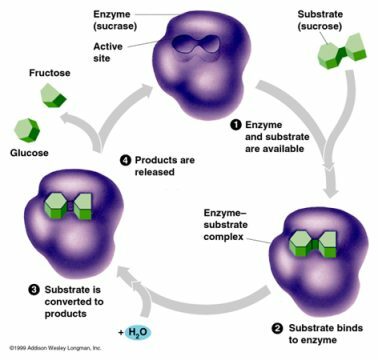 In the preceding graphic, the enzyme sucrase binds with the substrate sucrose to convert it to the end products of glucose and fructose. Enzymes and pH: Enzymes are extremely sensitive and their activity is affected by the pH and temperature of the immediate surroundings. Each has an optimum pH and temperature range at which its activity is most efficient. What Are Some Uses of Enzymes? There are more than 3,000 different types of enzymes in the human body, and all of them must be present in each one of our 100 trillion cells to function normally. Digestive enzymes such as amylase (carbohydrates), protease (proteins), lipase (fats), and cellulase (cellulose) break the molecular bonds in the food we eat. Digestive enzymes render the nutrients small enough to be absorbed into the bloodstream through the small intestines and assimilated by the body. Metabolic enzymes are those that are produced by the body and are not used for digestion, but are involved in every other function of the body. They control the biochemical reactions that facilitate detoxification and energy production in every one of the 100 trillion cells in our bodies. Therapeutic enzymes, such as proteolytic enzymes, can be used to reduce pain and inflammation, improve circulation, support the immune system, and restore health in many other ways. Food enzymes are found naturally in raw foods and can digest about 75% of the ingested food they are contained in. They are denatured or destroyed by most food processing and cooking procedures. When the food you ingest still contains abundant active enzymes, it is much less stressful on your body because of not having to produce so much of its own digestive system enzymes. Now that you have a basic familiarity with the structure and function, take a few minutes to enjoy this short animated video presented by Enzymedica founder, Tom Bohager - author of the book Enzymes: What the Experts Know. Chew your food well to insure better carbohydrate digestion from the amylase enzymes in your saliva. To get the digestive benefits of natural food enzymes, eat more raw foods and minimally processed foods. Take a high quality full-spectrum digestive enzyme supplement with your meals, and notice the improvement in your health and well-being. Consider taking therapeutic enzymes between meals to address various health issues. Digestive System Enzymes Extract Energy and Nutrients From Food. They are produced by the body to help break down food into molecules small enough to be absorbed through the lining of the small intestines. Digestive Enzymes Supplements Relieve Indigestion, Improve Health, Slow Aging These supplements do more than digest food and relieve symptoms of indigestion. They also help the body produce the metabolic enzymes needed by every cell of the body.